Contemporary historians have been debating for a few years now if they should open the Speyer wine bottle, which is believed to be the world’s oldest bottle of wine. The Pfalz Historical Museum in Germany has been home to the legendary 1,650-year-old bottle that is sealed with wax and contains a white liquid. Even though the oldest evidence of wine production was found in Armenia around 4100 BC, it would be safe to say that Western tradition of producing and drinking wine most likely started in the territory of Classical Greece, when people drank it during breakfast. A person who didn’t drink wine in ancient Greece was considered a barbarian and the Greeks worshiped Dionysus as the God of wine and partying. The Romans adopted their love for wine from the Greeks and spread its production and consumption across their vast empire. Many centuries later, wine production and consumption would dramatically increase in most parts of the world, burgeoning from the 15th century onwards as part of European expansion. No One Questions that Vikings Drank; But Did They Make Wine? That possibly explains why wine, more than any other man-made liquid, has always been invested with layers of social significance, stigma, and messaging. It’s associated with thousands of years of human history and carries incredible value as a symbol that communicates your social class when consuming it. The period from around 1810 until 1875 has been termed by modern historians as the golden age of wine. In northern Europe, the industrial revolution and the influx of wealth from expanding overseas empires was providing a growing middle class with resources for luxuries, some of which included wine. Legal structures were changing to facilitate credit and investment was becoming more widespread – so it was easier to expand wine production. Another key change was heralded by the free-trade agreement between France and Britain in 1861. This led to a period when tariffs on wines were almost entirely gone – thus ensuring that export growth stimulated production not merely for the French, but also for the Germans and Spanish, and, to a lesser extent, Italians. It was during that period (1867), when a bottle of unusual wine was discovered in Germany. As Natalia Klimczak reports in a previous Ancient Origins article , a Roman noble was buried with a bottle of locally produced wine around 350 AD. 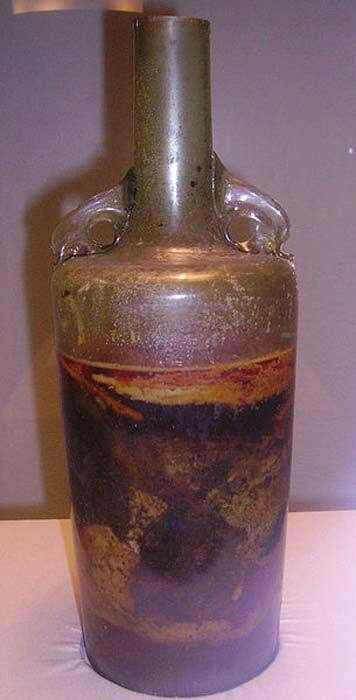 When his burial was unearthed near the city of Speyer in Germany, the researchers were shocked to see that there was still liquid within the bottle. It’s no secret that the older a bottle of wine is, the better its contents will taste. In this case, however, the Speyer Bottle is so old that many experts doubt if its wine is drinkable. 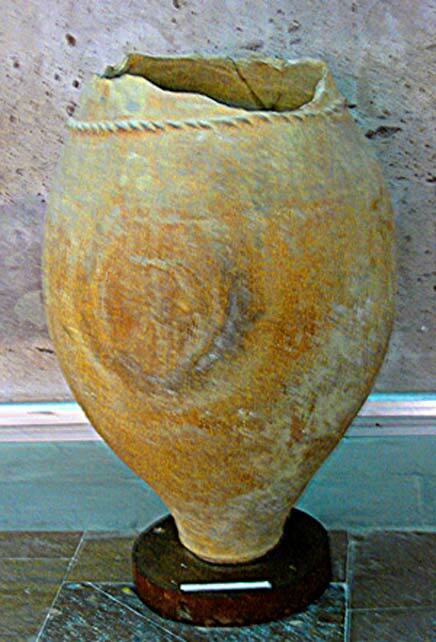 Widely considered as the oldest known liquid wine recovered from any archaeological site, the bottle has been dated between 325 and 350 AD. Although it was analyzed by a chemist during the First World War, the bottle was never opened. A splash of olive oil and a seal of hot wax has kept the white wine liquid down in the 1,650 years since it was made. 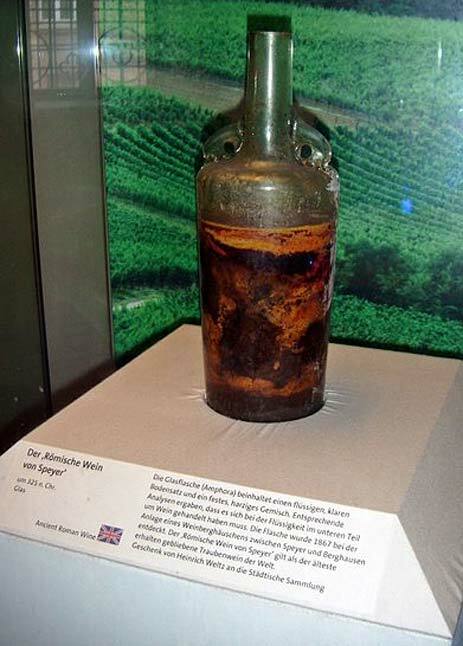 The wine bottle has been on display at the Pfalz Historical Museum for more than a century and though it is a curious artifact no research team dares to open it.